Traditional PLCs offer various forms of data persistence (so your PLC memory isn’t lost when the PLC loses power). Some use battery-backed SRAM, which maintains power to all or a portion of the memory even when power is removed from the PLC. Some use flash-memory technologies. Since TwinCAT 3 runs on PC hardware, and PC memory isn’t battery-backed up, it has a different mechanism for storing persistent variables. 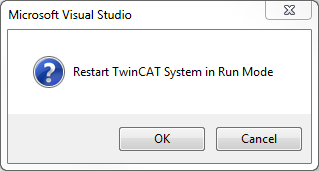 By default, variables in TwinCAT 3 are not persistent. If you restart the runtime, or your PC loses power, then when your PLC program restarts the variables will revert to their default state. This is fine for many situations (we generally want our outputs to start in the off state anyway). However, there are times when we need to store machine state such as part presence or process information and we don’t want to lose it when the PC reboots. TwinCAT 3 allows you to explicitly define variables that are “persistent” for this purpose. In this chapter I’ll explain how to create persistent variables, how TwinCAT 3 saves and restores them, and how to write a program to periodically save them to a file in case of a crash or power loss. Adding the PERSISTENT keyword after VAR_GLOBAL tells TwinCAT 3 that any variables in this section should be written to persistent storage when the runtime shuts down, and restored from persistent storage when the runtime restarts (the data is actually stored to a file on disk, and I’ll explain more about the details later). I’ve declared two integer variables (one persistent and one non-persistent) as examples, and I’ve initialized them with default values (5 and 3 respectively). You can see that the persistent variable retained the value of 10 that we wrote to it, but the non-persistent variable reverted to the initialization value of 3 that we defined in the variable declaration. The written value of 6 was lost. The persistent data file is stored in the C:\TwinCAT\3.1\Boot\Plc folder, and it will be named Port_851.bootdata. 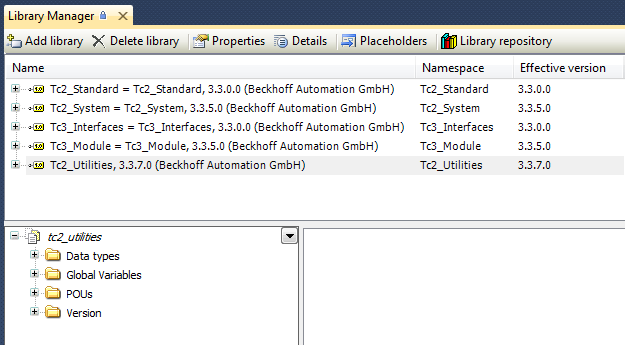 Each PLC instance on a runtime has an “ADS port number”. The default port numbers start at 851. You can change the port number, but that’s not important right now. The recommended way to install a TwinCAT 3 system is to use a PC with some kind of battery backup, like an Uninterruptible Power Supply (UPS). You must connect the PC to the UPS (via USB cable, etc.) and use the software provided with the UPS to make sure that Windows does a clean shutdown if the UPS loses power for any appreciable length of time. However, this isn’t good enough. Even if you use a UPS to provide Windows enough time to do a clean shutdown, there are still many ways that you can lose your persistent data (such as the UPS failing, the hard drive failing, or a runtime crash). Unless you can afford to lose the persistent data, you must do more to protect it. 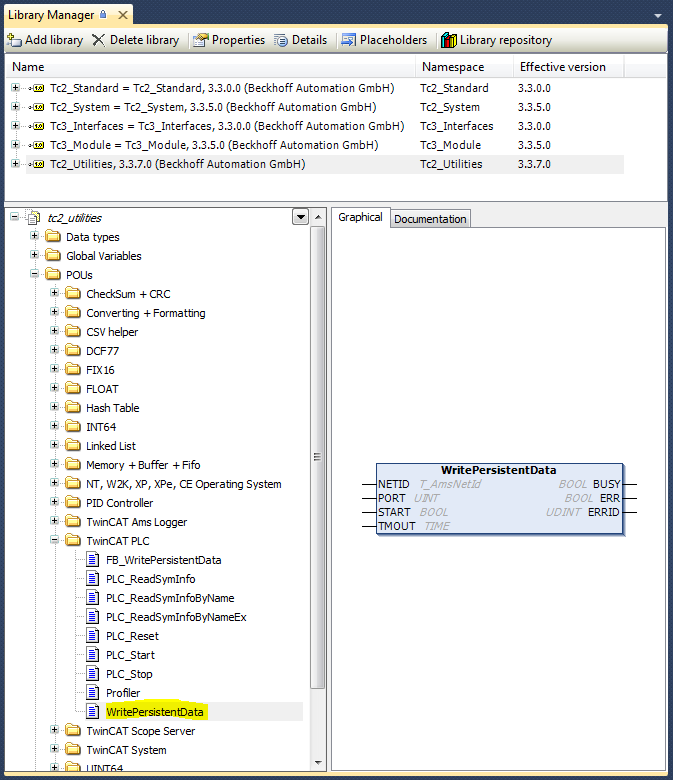 While your PLC program is running, the only up-to-date copy of your persistent data is the actual values of the variables in your PLC memory. The persistent data file is only written when the runtime shuts down cleanly, and it deletes the persistent data file after reading it when the runtime restarts. The first step in protecting your persistent data is to periodically write out the persistent data to disk while the program is running. 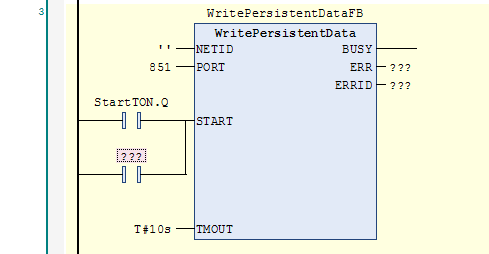 Thankfully TwinCAT 3 provides a function block called WritePersistentData that does exactly this. 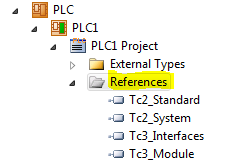 You can manually instruct the runtime to write out the persistent data file from within the PLC program. This is just like declaring a BOOL variable. 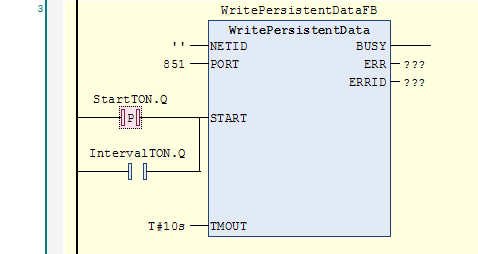 WritePersistentDataFB is the name of the variable, and WritePersistentData is the type. In this case, the type is a data structure that the function block needs to store its internal state. The NETID is an empty string (just two single quotes), which means that the AMS Net ID is the local target (i.e. the PC it’s currently running on). 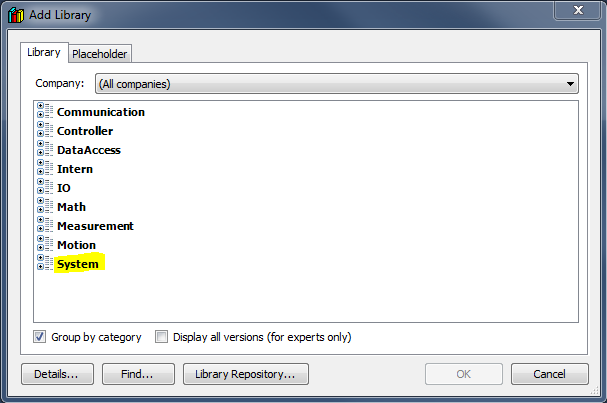 The PORT is 851 because that’s the ADS port number of the PLC1 program. 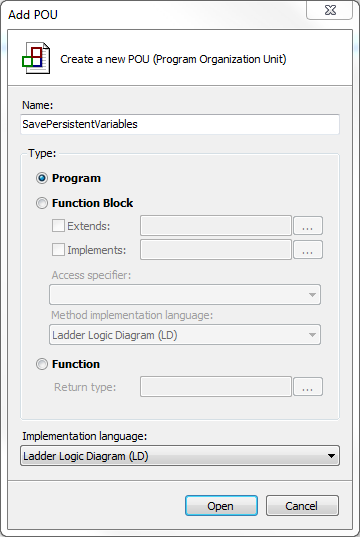 The WritePersistentData function block initiates a save of the persistent data when the START input transitions from off to on (also called a “rising edge”). The BUSY output will turn on immediately and will stay on until an acknowledgement has been received (or the timeout expires). 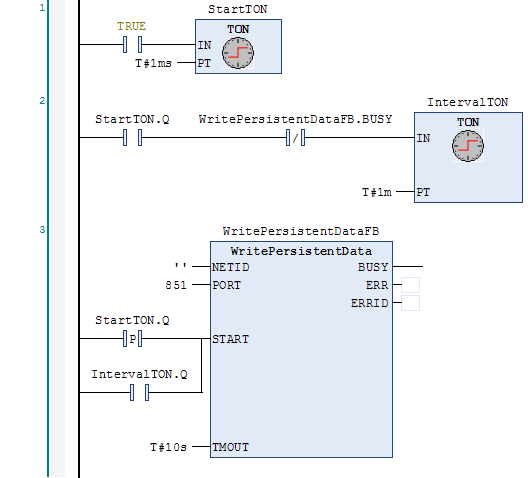 When the BUSY output turns off, if there was an error then the ERR output will turn on and the ERRID output will indicate the ADS error number (do a Google search for “ADS Return Codes” to see the list). The StartTON timer fires almost immediately when the PLC starts, and that gives a single pulse to the START input. During the initial write process, the BUSY output is on, which prevents IntervalTON from running. When the initial write is complete, BUSY turns off and then IntervalTON starts running. One minute later the IntervalTON timer completes and turns on the Q output. 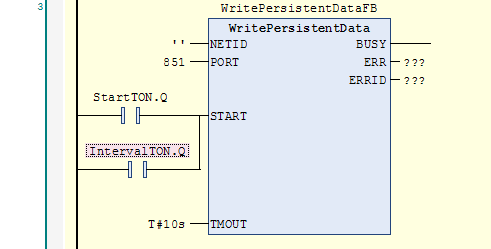 This triggers the START input again, which makes the BUSY output turn on, which resets IntervalTON until the write is complete. When the write completes, we go back to step 3. Before this program will run, you have to call it from your MAIN program. 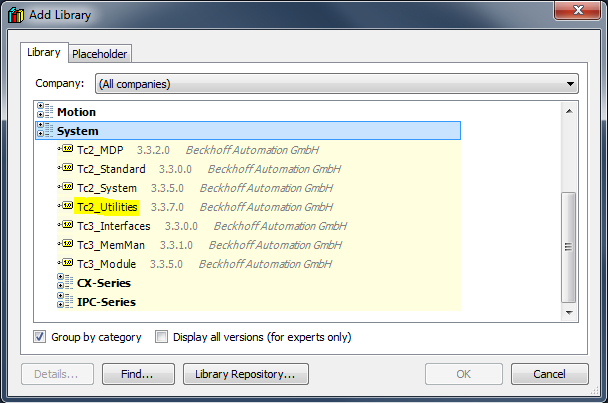 The QuickStart chapter explained how to call other programs from your MAIN program so I won’t repeat that here. Remember to login with an online change to start running this new program. When you execute this code, you can watch the C:\TwinCAT\3.1\Boot\Plc folder and see the Port_851.bootdata file created, and then see the file timestamp update every minute after that. Now we have a copy of the persistent data on the hard drive that is at most about 1 minute old. That will protect us if there is a runtime crash or the UPS stops working but it still doesn’t protect us from a corrupt file or a hard drive that stops working. To make sure you can recover from these scenarios, you need to make backups of the persistent data file at regular intervals to another computer. Note that in the event of a crash, the restored persistent variables might be up to 1 minute old. That’s still a problem for part presence data, but at least you won’t lose all your setpoints. The persistent data saved when the runtime does a clean shutdown is the primary method for protecting the consistency of your persistent data. That means a good UPS connected to the PC with the USB cable and running the UPS software so it will do a clean shutdown in the event of a power loss is absolutely necessary for every production system using TwinCAT 3. This chapter is part of the TwinCAT 3 Tutorial. 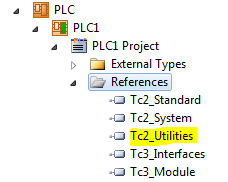 Continue to the next chapter: Structuring PLC Logic.